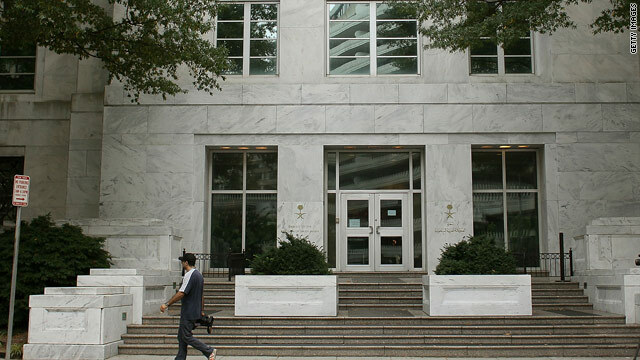 The Saudi Arabian Embassy in Washington on Tuesday. U.S. agents have disrupted a $1.5 million "murder-for-hire scheme" involving Iran, Attorney General Eric Holder announced Tuesday. "The criminal complaint unsealed today exposes a deadly plot directed by factions of the Iranian government to assassinate a foreign ambassador on U.S. soil with explosives,” Holder said. Read the latest developments here. Below is a timeline according to the federal complaint (PDF) filed in the case. Spring 2011: In a plot code-named "Chevrolet," Manssor Arbabsiar, aka Mansour Arbabsiar, a naturalized U.S. citizen with both U.S. and Iranian passports, and Iran-based Gholam Shakuri, aka Ali Gholam Shakuri, a member of the Iranian Revolutionary Guard, and others conspire to kill a foreign official, U.S. authorities say. Federal officials say Arbabsiar met "on a number of occasions in Mexico with a Drug Enforcement Administration confidential source." Posing as an associate of a sophisticated and violent international drug cartel, the source, called CS-1 in the federal complaint, was hired by Arbabsiar and his cohorts to assassinate the ambassador. May 24: Arbabsiar travels back and forth from Texas to Mexico, meeting with the DEA source, CS-1. During the course of the meetings, Arbabsiar inquires about explosives, explaining that he was interested in attacking an embassy in Saudi Arabia. The agent tells Arbabsiar that he was knowledgeable about plastic explosives. May 30: Arbabsiar flies to Houston, according to travel records. June 23: Arbabsiar returns to Mexico, where he meets the agent, who is posing as a drug trafficker. At the meeting, Arbabsiar explains that his associates in Iran had discussed a number of violent missions for the source's criminal associates to execute, including the murder of the ambassador. July 14: Arbabsiar meets with CS-1 in Mexico. They both speak English at the meeting, enabling CS-1 to record the conversation, as directed by law enforcement agents. CS-1 tells Arbabsiar that he would need "at least four guys" and that CS-1 was "talking to one of the guys" and would "take the 1.5 for the Saudi Arabia," meaning he would assassinate the ambassador for $1.5 million. CS-1 tells Arbabsiar that he would "go ahead and work on Saudi Arabia, get all the information that we can." Arbabsiar agrees that killing the ambassador should be done first, to which CS-1 says, "you just want the, the main guy." When discussing the money, Arbabsiar tells CS-1 that the "money's 100,000" but that he will "send 100 ... 10,000, 10,000, 10,000. ... I don't wanna send it to one guy, one shot," meaning Arbabsiar wants to send the money to CS-1 in installments and not in a single transfer. Arbabsiar says his cousin in Iran requested that Arbabsiar find someone who could carry out the assassination of the ambassador. He says his cousin was "wanted in America" and had been "on the CNN" and was a "big general in (the) Army." July 17: CS-1 and Arbabsiar meet again in Mexico, where the undercover DEA agent is provided with a bank account and routing number so that payment could be made for the killing of the ambassador. CS-1 records the conversation, as directed by federal agents. "My guy over there ... he's already in Washington," CS-1 says, indicating that he purportedly had one of his cohorts travel to Washington to conduct surveillance on the ambassador. "I got this on the computer. ... Is this the guy right here?" he asks, showing a picture of the ambassador, to which Arbabsiar says, "Yeah, that's him." CS-1 says he started to investigate the ambassador, learning that he traveled with about "eight to seven security people around him. ... He goes out and eat like two times a week in a restaurant." CS-1 then says, "I don't know what exactly your cousin wants me to do." After some conversation, Arbabsiar says, "he wants you to kill this guy." "There's gonna be like American people there ... in the restaurant. You want me to do it outside or in the restaurant?" CS-1 asks. To which Arbabsiar replies, "doesn't matter how you do it. I mean, you know, you have no choice, is that right?" Arbabsiar says his cousin wanted the ambassador killed, without bystander casualties if possible ("by himself, kill is better") but not if necessity dictated otherwise ("sometime, you know, you have no choice"). Also at the meeting, Arbabsiar says that his cousin was "working for the government (of Iran) but he's working outside. ... He's working like (a named, non-Iranian intelligence agency)." Seeking to re-assure CS-1 that the money would be paid, Arbabsiar tells him that his cousin had the support of the Iranian government. "This is politics, OK. ... It's not like, eh, personal. ... He's got the government behind him. ... He's not paying from his pocket." Arbabsiar says his cousin used another man as a go-between to deliver funds to him. "He's like a colonel, the guy," he says. "Did the colonel take the money, the money to you?" Arbabsiar asks. "Yes, man. He opened the door for me, the colonel. He bring the envelope. He put the envelope there for me." The "colonel" was Gholam Shakuri, federal officials said. Arbabsiar tells CS-1 that the ambassador had to go regardless of how many bystanders died with him. "They want that guy done (killed). If the hundred go with him, f*** 'em," he says. When CS-1 replies that he could blow him up or shoot him, Arbabsiar says, "It doesn't matter. ... Whatever is easy. ... Let it hit the restaurant. If, if you can do it outside, do it. If not, restaurant, hit it, it's OK."
CS-1 tells him that the eatery may be filled with people "from 100, 150" people inside and "buildings on the sides" and U.S. senators who dine there. Arbabsiar dismisses the fears as "no problem" or "no big deal." July 20: Arbabsiar leaves Mexico, according to travel records. August 1: Arbabsiar causes an overseas wire transfer of nearly $50,000 to be sent by a foreign entity from a bank located in a foreign country to an undercover FBI bank account ("the UC bank account"). The transaction is transferred through a New York bank. August 6: Arbabsiar speaks with CS-1 via telephone, which was recorded at the direction of federal agents. During the conversation, CS-1 asks Arbabsiar whether he had "already finished the other half of ... the money." Arbabsiar says, "I sent it yesterday," meaning he sent the second half of the $100,000 down payment. Federal officials say "the other half" of the $100,000 downpayment was received around August 9. August 9: Arbabsiar facilitates an overseas wire transfer of nearly $49,960 to be sent to a bank in a foreign country through a New York bank to the "UC Bank Account." August 11: During a phone conversation, Arbabsiar asks CS-1, "Did you check the bank?" CS-1 replies: "I check in the bank. Everything is there." Federal officials say Arbabsiar was confirming that CS-1 had received the $49,960 that arrived in the UC Bank Acount. August 28: CS-1 returnes a phone call to Arbabsiar that was recorded at the direction of federal agents. CS-1 initially requests that Arbabsiar send someone to Mexico as collateral. Arbabsiar asks "how long (he) need(s) to stay in Mexico.' "
September 2: Arbabsiar speaks with CS-1 in a telephone conversation that was recorded. Arbabsiar inquires through code language whether plans to kill the ambassador were still under way, asking whether the "building is getting painted." CS-1 responds, "We're still doing that." Arbabsiar, according to federal officials, then explains to CS-1 that once the ambassador was killed, more assassination projects would be in the works. "Once we do this one, you gonna open a (U/I) like, uh ... you got the number for the safe," he says, "and "once you open the door, that's it. You know what I mean ... you don't have to worry about anything." September 12: Arbabsiar and CS-1 speak by telephone. The conversation is recorded. Arbabsiar tells CS-1 that "the number is gonna stay the same thing," $1.5 million for the assassination of the ambassador. Arbabsiar indicates that more killings were in the works but that the ambassador had to be taken care of first. "The first one they just want it ... for test," he says, suggesting that the ambassador's killing was a test run that would lead to future assignments if successful. September 20: CS-1, in a recorded phone conversation, tells Arbabsiar, "I'm ready for the ... for the thing, for the house, man, to be painted, but ... I need to, I need, either I need you or I need half of the ... of the check that we're gonna receive ... so I can go ahead and ... be finished with the job." Federal officials say CS-1 was asking for either half of the agreed-upon price ($1.5 million) or for Arbabsiar to go pers0nally to Mexico to serve as a form of collateral for the final payment of the assassination. Arbabsiar agrees to travel to Mexico. "I'm gonna go over there (in) two (or) three days, I'll go over there. ... Don't wait for me. Get ready, but I'll be over there," he says. September 28: Arbabsiar flies to Mexico but is denied entry. He then takes a plane to JFK International Airport in New York. Unbeknownst to him, law enforcement officials aboard the flight conduct surveillance on Arbabsiar. After exiting the plane at JFK, Arbabsiar is arrested. Law enforcement officials find in his luggage $3,900 in $100 bills, a U.S. and Iranian passport, some Iranian currency and a travel itinerary detailing a flight from Mexico ending in Tehran. After several hours in custody, Arbabsiar agrees to waive his Miranda rights and speak to law enforcement agents, according to federal officials. Speaking Farsi, Arbabsiar details how he was recruited, funded and directed by men he understood to be senior officials in the Quds, a unit of the Iranian Islamic Revolutionary Guard Corps. The men, including his cousin, told Arbabsiar that they wanted him to find someone to kidnap the Saudi Arabian ambassador and that he should find "someone in the narcotics business, because people in that business are willing to undertake criminal activity in exchange for money," according to the criminal complaint filed in the case. Arbabsiar also implicated Shakuri as working for his cousin. Arbabsiar got thousands of dollars for expenses from this cousin and thousands more from Shakuri. Arbabsiar was instructed to use the code word "Chevrolet" for the ambassador plot when communicating with Shakuri. In late September, Arbabsiar met with Shakuri in Tehran, explaining to him that CS-1 wanted either half the money previously promised for the completion of the slaying or to have Arbabsiar come to Mexico as a guarantee of payment. Shakuri dismissed paying CS-1 more money and warned Arbabsiar not to go to Mexico or he was on his own there. In custody, Arbabsiar agres to call Shakuri so that agents could record the discussion. "Are you OK? ... Are you well?" Shakuri asks Arbabsiar. He replies: "Yes, I wanted to see how you're doing and to tell you I am well." "Okay, thank God, stay well," Shakuri says, adding, "I was waiting." Sharuki later asks, "What did you do about the building?" a reference to the plot to kill the ambassador, federal agents said. October 5: In another call recorded by federal authorities, Arbabsiar and Shakuri discuss the plot. "I wanted to tell you, the Chevrolet is ready, it's ready, uh, to be done. I should continue, right?" Arbabsiar tells him. "Yes, yes, yes," Shakuri says, adding that he should "buy (the car), yes, buy all of it." Later in the conversation, Arbabsiar, talking about CS-1, says, "This boy wants, uh, some money. He wants some expenditure. What do you say, should we give him some more? He wants another 50." "With you, no, you ... that amount is fine. ... Tell him to finish his work, then we'll give him the rest. He should buy the car for us first," Shakuri says. "Just do it quickly. It's late. Just buy it for me and bring it already." October 7: During another conversation, Arbabsiar tells Shakuri that CS-1 is pushing him to pay him the down payment. "This Mexican ... keeps insisting on the thing," Arbabsiar says. At one point, Shakuri broods about asking his superiors for more funds, chiding Arbabsiar to get CS-1 to live up to his side of the deal. "He needs to deliver it to us, OK? ... You guaranteed it," he says. "Well, I guaranteed it, but they ... they're not ordinary people. ... They're not law-abiding ... people," Arbabsiar says. "You said it yourself, they - from our point of view of - when we get our merchandise, we get our merchandise. We have guaranteed the rest. You were our guarantee," Shakuri tells Arbabsiar.